No need to curb your big appetite in a tiny home—here are 175 recipes uniquely designed to be made in the micro-kitchens of tiny homes and apartments. Tiny homes are the next big thing—frequently featured in HGTV shows such as Tiny House, Big Living and in popular lifestyle publications such as Good Housekeeping, tiny homes are gaining popularity for their economic and ecological sensibility. But with tiny homes come tiny kitchens—according to the Tiny House Blog, many tiny homes have only two burner stove tops, a mini-fridge, and no microwave or oven. At first glance, this may seem like a challenge, but Tiny House Cooking proves how easy cooking in a tight space can be! 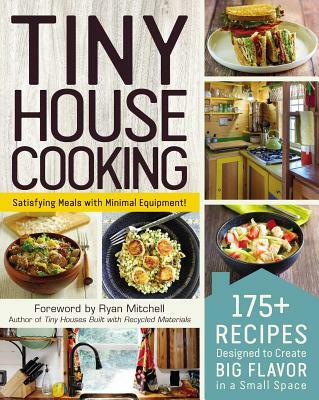 Featuring 50 beautiful full-color photos of tantalizing finished recipes and a foreword by tiny house living expert Ryan Mitchell, Tiny House Cooking includes 175 recipes especially designed for the pocket-sized abode—none of the recipes require an oven, microwave, toaster oven, freezer, full-sized refrigerator, or any other extraneous device—as well as information on essential equipment, space-saving ideas, and innovative ways to reduce and recycle creative waste. Find delicious new ideas for breakfast, sandwiches, appetizers, snacks, main dishes, desserts—and more!—all only using two pots at most. "The perfect guide … .Once you grab this, your cooking knowledge for a tiny living will skyrocket to new heights." "I would definitely recommend the Tiny House Cooking cookbook to anyone looking for high quality recipes whether you have a tiny kitchen or not." "If you live in a tiny home, dorm, apartment, recreation vehicle or house boat or just want to simplify your life, yet still want to eat well, this cookbook is perfect for you! All of the recipes work for cooking in a tight space with minimal equipment, yet still taste like it came out of a great chef’s spacious accommodations. It’s hard to believe, but none of the recipes require an oven, microwave, toaster oven, freezer, full-sized refrigerator, or any other extraneous device. Also, great info shared on equipment you DO need, space-saving ideas, and creative ways to reduce and recycle waste." "Handy … you’ll find recipe that are perfection portioned for two people, meaning you don’t have to worry about running out of room, storing ingredients before you cook, or trying to fit your leftovers in behind the milk that’s about to spoil."